The iPad is finally starting to grow up. Despite the device becoming an instant sales phenomenon upon launch, iPad in its earlier years of life was never a legitimate PC replacement – nor was it meant to be. From birth the iPad existed not to cannibalize the Mac, but to supplement it. Steve Jobs called it a "third category" of device, fitting snugly in the space between a laptop and smartphone. In recent years, however, the iPad has gone through a stark transition. If you want an iPad to supplement your iPhone and Mac, you can still get one in the $329 "just call me iPad" model introduced last spring. But the bulk of Apple's iPad efforts of late have centered on making the device a capable replacement for the traditional computer. 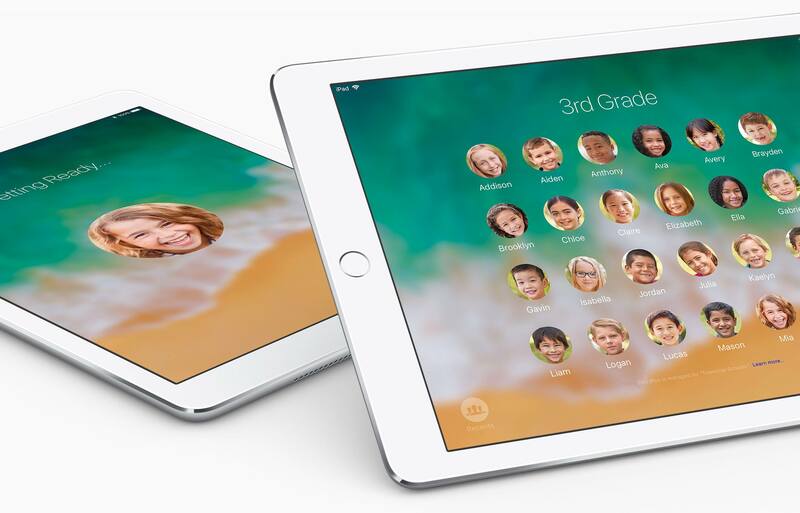 The iPad Pro and iOS 11 represent a new vision for the iPad. This vision puts the iPad not next to the Mac, but instead squarely in its place. It's a vision embodied by the question, "What's a computer?" Windowing is one of the most basic UI concepts of the Mac, and has been for a long time. When it makes sense for an app, windows can be used to open multiple instances of the same app – multiple notes, PDFs, Word documents, etc. all in separate places. But windowing, in the traditional sense at least, doesn't exist on the iPad, and likely never will. There's another answer to this problem, though, one that the Mac recently adopted: tabs. Tabs have long been a standard interface element in web browsers, including Safari on both the Mac and iOS. But in 2015 their usefulness on the Mac expanded systemwide when macOS Sierra added the ability for any app to have a tabbed interface. Sierra's tab expansion is relevant here because the iPad should realistically be able to follow suit. The chance of windowing on iOS may be practically nonexistent, but there's nothing about current iOS paradigms that would prevent tabs from becoming a systemwide feature. If we assume that iOS will eventually allow viewing two instances of the same app at once, then using tabs to power that system would make the most sense due to the groundwork that's already been laid in Safari on iOS. 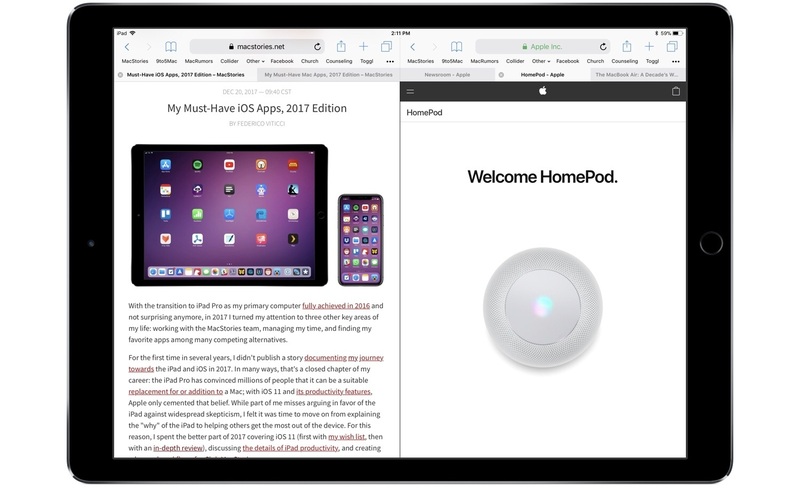 One of the few iPad-specific additions to iOS 10 was a Safari enhancement that enabled viewing two webpages at once in Split View. You could toggle this view using menu options, but the most natural way was with a gesture: simply pick up one of your existing tabs, drag it to either side of the currently-active tab, and the two tabs would enter Split View. The feature works beautifully, and was a clear foreshadowing of what iOS 11's drag and drop system would bring. I believe the most natural, iPad-appropriate method of enabling multiple instances of a single app is seen in these clues from macOS Sierra and iOS 10. Every app that wants tabs on iOS should be able to use them, with the added benefit of in-app Split View modeled after iOS 10's Safari. Out of apps I use every day, Ulysses, Notes, Files, and Slack would benefit most. With Ulysses and Notes, I would regularly keep multiple documents open at once so I could easily switch between them, and in-app Split View would enable writing while keeping research visible at the same time. Files adopting tabs would save me from the endless location switching I have to do each day, while in-app Split View support would make it easier to compare the contents of different documents or even different folders with each other. Slack wouldn't benefit as much from tabs, since its navigation bar remains on-screen most of the time, but it sure would be nice to have two different channels visible simultaneously in Split View. The tools are all in place: enabling multiple instances of an app would be a natural next step in the iPad's evolution. Where it can get really confusing though, is when you dive a level deeper and explore the myriad of default configurations for each Mac. Not counting color options, the Apple Store offers a whopping 23 potential choices to shoppers. And of course, those 23 options aren't the stopping point – with each one of them, you can tailor things like the processor, memory, storage, and more to your exact specifications – in the end, your Mac buying options are virtually limitless. On one hand, the level of simplicity across the line is refreshing when compared with the Mac. But if the iPad is to become a true, mass market alternative to traditional computers, it needs to find a healthy new middle on the spectrum of Mac-level fragmentation and iPad-level simplicity. The iPad's current distinction between consumer and professional-focused devices is a start, but I hope to see even more divergence in the line going forward. Whether you would continue calling it an iPad or not, an iOS-powered laptop would be a fascinating product. The laptop form factor is tried and true, providing a more rugged, durable feel than the current iPad Pro and Smart Keyboard combo. The device's keyboard could be backlit and provide larger keys, with the potential even for an expansion of Touch Bar to iPad. In a future where iOS and macOS app development converge, the Touch Bar would be a natural fit for an iOS laptop. Would the device have a trackpad? I'd see the benefit of one, but it could go either way. If you can't imagine working primarily on iOS today, an iOS laptop likely would do little to change that. But if, like me, the iPad is already your full-time computer, then a laptop running iOS with a Touch Bar, trackpad, and 15-inch display probably sounds, well, magical. On the negative side, unless Apple can craft an elegant way to make this device function as a 2-in-1, it would likely lose most or all of its usefulness as a tablet. Despite that trade-off, however, an iOS-powered laptop might just be the perfect fit for certain users – I would certainly consider it. My 12.9-inch iPad Pro sits in "laptop mode" about 90% of the time, with the Smart Keyboard attached and in use. That remaining 10% where I benefit from it being a tablet would be tough to replace right now, but if, say, an iPhone X successor with a 6.5-inch display were available, that device could be a valid substitute for my current tablet use of the iPad – thus making an iOS laptop all the more desirable. Another new form factor the iPad could adopt is something resembling Microsoft's Surface Studio – a desktop powerhouse with a sizable display that could be used both in traditional mode and a drafting-table mode. If such a device were to ever exist, it would increase the need for a method of iOS interaction involving trackpad and cursor. The device would be primed for video and audio production, app development, and all the other things the iMac excels at today. 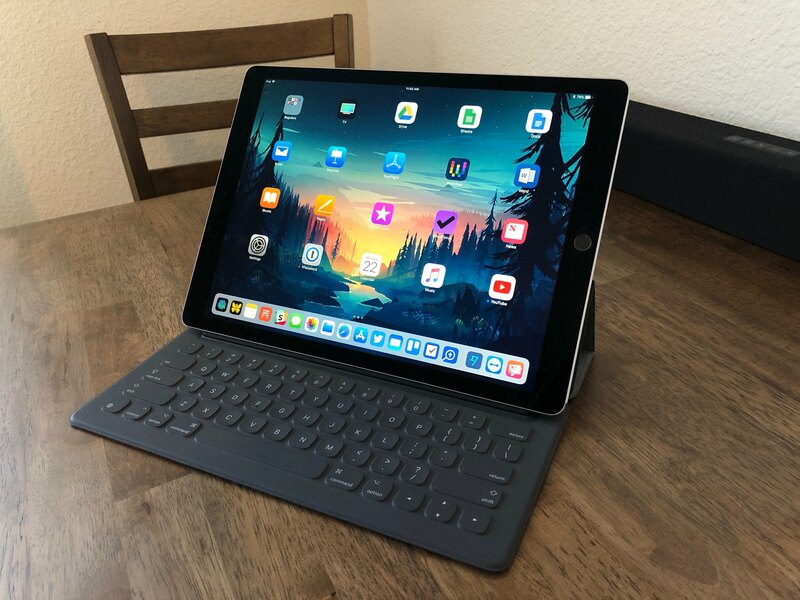 It might sound crazy to imagine the iPad as a desktop computer, or even a laptop that loses all tablet capabilities, but if it never adopts substantially new form factors, the iPad will remain limited in ways that iOS devices don't need to be limited. iOS may have been birthed for a tiny 3.5-inch display that, in its time, no one would have mistaken for a "real" computer, but today, many people's only computer is an iPhone. And for those who need something more than an iPhone for things like work, the iPad – spurred on by the 12.9-inch iPad Pro – has pushed iOS to become a competent workhorse. There's more that can be done, however, with the help of continual software development and further expansion of hardware. Effective power management is essential to mobile devices with relatively small batteries. One of the ways iOS ensures your device's optimum battery life is by making sure apps that aren't on-screen use little to no processor power. If apps on your iPhone were able to run constantly in the background, your battery would be at risk of draining at an unacceptable rate. Many iPad users may treat the device like an iPhone – unplugging it for a day of use, then charging overnight. Due to the iPad Pro's importance to my work, and my need for it to be ready at a moment's notice for taking on the go, I treat the device more like a laptop than a tablet. As I used to do with my MacBook Air, when I'm working at my office desk, my iPad Pro is normally kept plugged in. I suspect this behavior isn't unique among those who work full-time on an iPad Pro. As the iPad grows to resemble a laptop more than a tablet, iOS should follow suit. Laptops are often used on the go, but they are also regularly used in a static setting near a charger; as a result, they don't need the same level of power management as iOS devices historically have. The iPad Pro, in all its laptop-ness, is uniquely suited to be the first iOS device to allow apps to run non-stop in the background. It makes sense for an iPhone to not have persistently running apps, because the vast majority of the time the device is used off the charger. But the same logic no longer holds true for the iPad – at least, not for the iPad Pro. Why does this device, which spends most of the day in use at my desk, plugged in, need me to regularly open apps like Dropbox and Google Photos to ensure that those services can backup recent photos I've taken? Sure, maybe those processor-heavy tasks should be paused when I'm on battery power, but when I'm not, there's no reason those apps shouldn't have the same privileges that Apple's Photos app has already. Outside of cloud storage management, background privileges for apps could enable a host of helpful utilities and automation. Clipboard management, for example, should be just as easy on the iPad Pro as it is on a Mac, where an app like Copied can instantly, invisibly log everything you copy across the system. Wouldn't it be great if an app like Workflow could become more Hazel-like, triggering workflows automatically in the background based on pre-set rules? These types of features make the Mac work for you, invisibly getting things done for the user's convenience. In order to become a more powerful machine that serves professional users, the iPad needs the ability to do the same. Much of Apple's best app development work is found on iOS. The newly redesigned App Store is a beauty to behold and delight to use, Apple News offers easily my favorite reading experience on digital devices, and Mail – even with its shortcomings – remains my favorite email app despite an abundance of third-party alternatives. Apple by and large makes great iOS apps; unfortunately, the target market for those apps isn't professionals. Contrast Apple's app portfolio on the Mac with iOS – you'll find plenty of solid iOS apps that simply aren't available on the Mac, but when it comes to professional-geared apps, the story's entirely different. There's nothing first-party on iPad that comes anywhere close to the power of Final Cut Pro X, Logic Pro X, and Xcode. I don't think it has to fall on Apple to create professional grade apps in every domain, but I wish they would do some leading by example. Final Cut and Logic equivalents on iPad would go a long way toward showing Apple's commitment to the iPad as a device for professionals. Even if those apps never existed, though, enabling app development on iOS via an Xcode-like iPad app is essential. Third-party teams can build their own apps for video or audio work, but only Apple can create Xcode for iPad. And maybe, once iPad-first users can create apps directly on their favorite device, we'll begin seeing more evidence on the App Store of just how powerful an iPad app can be. This one's a no-brainer. Not only is it a feature that traditional computers have had for ages, but it also fits with the way many iPads are used today. Despite their lack of proper multi-user support, iPads are often shared devices in a household. If that isn't reason enough, how about this: multi-user support already exists on the iPad, but it's exclusive to education customers. Just bring it to everyone, Apple. The only potential wrench in this idea is that Face ID will likely arrive on iPad in the near future, and, assuming the technology replaces Touch ID altogether, Face ID's current limitation to one saved face, and issues distinguishing between family members, would make multi-user support challenging. Apple could always resort to using only passcodes for user login on Face ID-equipped iPads, while letting older iPads with Touch ID use fingerprint authentication, but that seems unlikely – it would behoove Apple to make sure the best multi-user experience is found on the newest, most advanced devices. If Face ID does come to iPad soon, we may be left waiting for it to advance past its current limitations before multi-user support arrives. Looking over this list, I'm struck by how realistic and attainable these requests are. Sure, some might never happen, but most seem inevitable if the iPad continues to grow. Which leads to an important question: if the iPad does evolve in these ways, what happens to the Mac? The iPad is already proving a formidable Mac-alternative for some users – what happens if it continues closing the gap by adopting the Mac strengths I've listed? If the iPad offered support for multiple instances of an app, was available in a more diverse array of hardware, allowed apps to get things done persistently in the background, was home to Xcode, Final Cut Pro, and Logic Pro equivalents, and became a proper shared device with multiple user accounts – why would people continue using the Mac? The Mac will always have a base of users who are most comfortable with it and don't want to transition to a new thing. But that base, in this hypothetical advanced-iPad future, likely wouldn't be big enough to merit continued investment from Apple into the platform. This, I fear, is the greatest hindrance to the iPad's development. 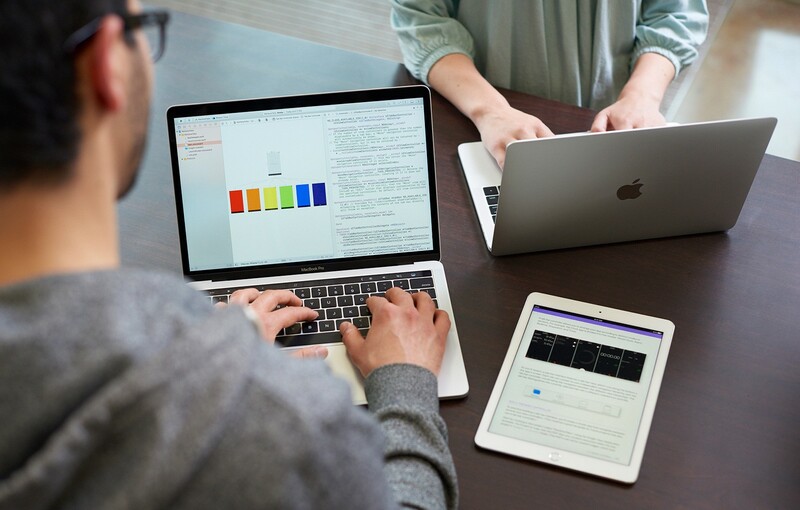 Unless the Mac changes in substantial ways, continuing to evolve enough to stay meaningfully ahead of the iPad, the iPad's growing capabilities will lead to greater cannibalization of the Mac. How far down that road is Apple comfortable traveling?